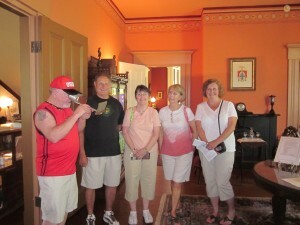 Typically our guided museum tour starts at the top of the hour and lasts 60 minutes. Other times and shorter tours can be arranged. $6 for adults, $5 for seniors 65 and above; $3 for ages 6-17, and free for children under 6. Through this tour of the grand Victorian home and grounds, you’ll learn the story of the true-grit effort to bring peace and justice to Indian Territory, see a full collection of 19th century furnishings, and get a feel for the grace of Victorian life in Fort Smith. Private rentals, photography sessions and group tea-and-tours are available throughout the week by special appointment. Please call or email for more information. We await your v isit to the Clayton House, one of Fort Smith’s preserved relics with a rich guided tour that has helped make this city the “Number One True Western Town.” Fort Smith made the list by True West Magazine for both 2013 and 2014. Directions: From Garrison Avenue in downtown Fort Smith, go north on 6th Street five blocks. The Clayton House stands at the southeast corner of 6th and “F”. Parking along 6th Street is perfectly acceptable; limited and handicap parking can be found in the back of the museum.